A lot has been said about the capital of the Philippines -- you can read all about the traffic and the dirt all over the internet, not to mention the not so positive happenings in the political scene of late. But this is a travel website, so let's keep things positive, shall we? The Philippines is also known for the hospitality of the Filipinos, our beautiful beaches and for being an affordable country to visit. Manila, in particular, is known for the beautiful sunsets along Manila Bay. Google "Manila Bay sunset" and you'll see a huge amount of beautiful sunset shots. Unfortunately, the sun and the clouds weren't cooperating when we had an impromptu visit a couple of days ago but let me share with you some of the nice sunset photos that I found online. We were pleasantly surprised to see that the place improved leaps and bounds since the last time we went there. My college thesis was about Manila Bay and I had to spend days, no weeks, visiting the area to take footage and get inspiration for the script. I must admit that it was so difficult for me to do it back then because the bay was filthy with a strong repugnant smell and had no decent place where we could sit and just appreciate the sunset. That kinda gave away my age, right? I can imagine friends saying "Tambay tayo sa Manila Bay!" (Let's hang out at Manila Bay!) after a long day at school. It's also a place for outdoor activities such as biking, walking the dogs and jogging. I just wish that people were more mindful of their environment and to keep the bay as clean as possible. The government spent so much fixing this place (regardless of how many iterations there were depending on the administration) and even invested in disposal bins with clear labels. When I saw a construction worker dumping a pail full of debris and trash I wanted to push him in the water and let him get a taste of his own medicine. The instructions are very clear, right? Look at the trash on the left side of the photo. It's not as bad as how it was back when I was still going here but it's still a lot. When the kids saw the place (it was their first time), they were in awe and kept on saying that it was so beautiful. That's on a day with not so great weather. I wonder how they'll react if we go there on a beautiful day? Of course, a Get Lost trip with Talia and Erin won't be complete without a photo shoot for their social media accounts, right? This city has a lot of things to offer not just for tourists but for locals as well (below are some suggestions) -- just always keep in mind that there is beauty beyond the madness of Manila. I was reminded of that when I saw the sense of wonder and awe in my kids' eyes when they got a glimpse of what Manila has to offer. I've visited the ancient walled city several times -- on a kalesa, on a bike (an old tour also by Carlos Celdran), in a car, alone and with a guide. A walking tour with Carlos is a definite must do for me as I heard he offers something different to an otherwise ho hum tour. Aside from Carlos Celdran tours, I'd also love to have another go at taking a bike tour within the walled city of Intramuros. This time around though, I'd love to try out those bamboo bikes handmade by the villagers of Gawad Kalinga. And to take it a step further, I want to book a Bambike BGC Art Tour as well (in Taguig City). Food tours. Need I say more? I'm not sure if I prefer to nibble my way through Chinatown or if I'd rather have one big mouthful of historic Manila so maybe I'll do both. I suggest you do the same, too! 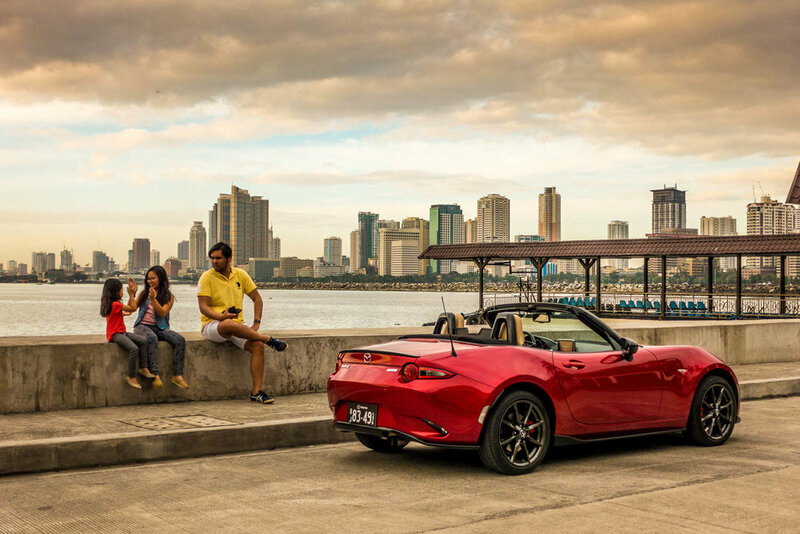 We'd like to extend our sincerest appreciation to Mazda Philippines for letting us enjoy this soul red beauty during a recent road trip. More about the Mazda MX-5 A/T Soul Red coming soon on Opus Macchina.